Without wishing to sound ungrateful, the best thing about being a beer writer isn’t actually the beer. It’s the opportunity to meet so many generous, welcoming, fascinating people who are fiercely proud of what they do. I’ve had the good fortune to travel all over Europe, experiencing the different cultures and trying to get a feel for what makes each nation’s distinctive beer scene tick. Brewers are always proud of their homes, and keen to show you an authentic experience, often with wonderfully messy consequences. In short, it’s true what they say: beer people are good people. They’re also broad-minded, adventurous people, who love working with their peers from different brewing traditions, who may have very different experiences, skills and ideas about what makes a great beer. When they’re done properly – rather than in the name of marketing – these cross-cultural collaborations can produce some truly astounding brews, that probably wouldn’t otherwise have seen the light of day. 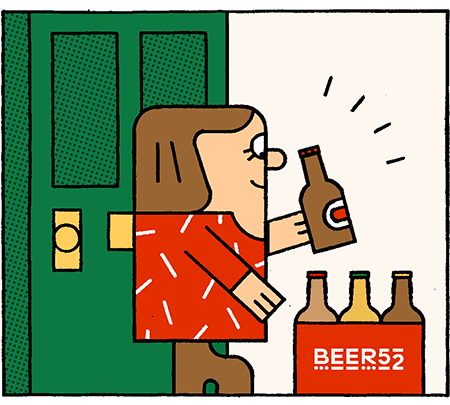 In fact, you could argue that this habit of taking existing knowledge and putting it through the kaleidoscope of one’s own experience and creativity has defined the international craft beer movement since some hairy Americans decided to revive English IPA nearly 50 years ago. 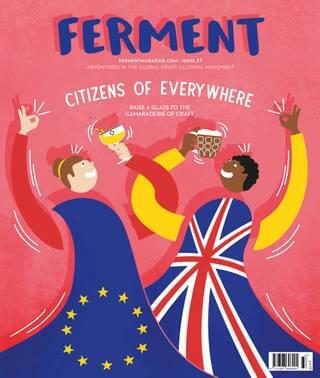 The Citizens of Everywhere project was set up by Sam Owens of Cambridge wine bar Thirsty and Justin Moor of Bristol’s Moor Beer, as a celebration of the pan-European brewing community and, to an extent, of the EU itself. Pairing 12 UK breweries with 12 of the best from throughout Europe, the aim is to create a superb line-up of beers first and foremost, but also to send out a message that the craft movement is truly international. Each recipe was inspired by an achievement or benefit of the EU, ranging from Peace in Western Europe to Freedom of Movement. “There’s so much division in the world right now, that it felt really important to stand up and say ‘we’re a community and we want to make our world bigger, not turn in on ourselves’,” says Sam. “I’ve been friends with Justin for a long time and knew he felt this way too, so when the idea of a collaboration came up we just decided to make it happen.” Moor is firmly anchored in traditional British brewing, being a long-time CAMRA favourite and still the only UK brewery to have a certified real ale in a can. Despite this, its outlook is distinctly international, and Justin has spent his career working and making friends with his peers across Europe. The very real friendship between Justin and Giampa from Italy’s Birrificio Lambrate is genuinely touching, and embodies the spirit of the whole project. This sentiment is echoed passionately across every brewery I speak with. Poland’s Stu Mostów, whose name appropriately enough means ‘100 bridges’, worked with Leeds-based North, which co-founder Gregg describes as “one of the most exciting brands in Europe”. He points out that the craft movement has created real demand among European consumers for beers from their neighbouring countries, and that demand is not going away. Yvan De Baets of Brasserie de la Senne in Belgium adds that working with breweries in other countries not only helps share beer knowledge, but also broader cultural understanding and appreciation. “I knew the Thornbridge beers for a long time, but I didn’t know the people behind them. I was delighted to meet them because they were very nice people. We had some great chats about beer in general, and we immediately knew we were speaking the exact same language. We have totally the same values around beer, the same tastes. Also their region is wonderful - without this collab I probably would never have seen this delightful part of Great Britain,” he says. Justin clearly put a lot of thought into the pairings, as even the brewers who had never met quickly found they shared a lot in common and became firm friends. This was even the case for partnerships which, on the surface, seemed a little off-piste, for example traditional cask brewer Ramsgate and Estonian craft renegades Põhjala. This blending of ideas, ingredients and brewing traditions, as a way of celebrating the diversity and collective creativity of modern Europe, is something each of the breweries seems to have picked up on and run with. Põhjala’s collaboration with Ramsgate is a Baltic porter which blends British malt and hops with spruce tips from the Estonian forest and juniper berries. At the time of writing, the exact schedule and shape of Britain’s exit from the EU – and, indeed, whether it will happen at all – are still very much in the air. Perhaps as you’re reading this, our various leaders in Westminster and Brussels will have pulled a lapin out of le chapeau. Perhaps not. There are undeniably corners of the industry that see a bright future for brewing and the beer trade in post-Brexit Britain. Wetherspoons’ founder Tim Martin has been characteristically vocal in his support of going it alone – up to and including a hard, no-deal Brexit – and has announced the entire chain will be switching to UK-brewed beers. CAMRA, meanwhile, has focused on the ‘opportunities’ for breweries and pubs, presumably in the hope that we’ll all start drinking cask when the price of Sierra Nevada hits £8 a pint. Other industry bodies have been cagey about making concrete predictions on the actual impacts, preferring (quite understandably) to play up the strengths of Britain’s indigenous trade, and campaign for tax and regulatory reforms to help pubs and breweries minimise any damage. In its ‘post-brexit manifesto’, the British Beer & Pub Association sets out a relatively strident wish-list for our future relationship with the continent, including continued access to skilled workers, free trade in alcohol, adoption of European competition law and environmental standards, and a more competitive tax regime. The health of Britain’s booze industry isn’t just a matter for the enthusiast either; as the BBPA points out, pubs and breweries make a significant impact to the economy at a national and local level, generating around £22 billion per annum and supporting 900,000 jobs. For tourists, Britain’s pubs are a beacon. They offer something uniquely British, and are often identified as a major attraction for a British holiday. Pubs are in the top three places to visit for tourists coming to the UK and seven out of ten visit a pub whilst they are here. Pubs serve over one billion meals per year and increasingly provide accommodation with some 50,000 rooms. "I hope that politicians from continental Europe and the UK will not be stupid enough to put more barriers up, because that’s the last thing we need"
With free movement of workers between the UK and EU looking highly unlikely, Brexit could also literally change the face of your local. Written evidence to Parliament from the BBPA shows the highest proportion of non-UK nationals working in the industry is among pub operators and their staff. Some 17% of pub workers are migrants, with 14% (over 71,000 people) EU citizens. In pub kitchens, European nationals make up an astonishing 23% of the workforce. When talking to breweries, “what are your plans for the next year” is a pretty standard (if unimaginative) interview question, for which most will have a stock answer, usually involving their export ambitions. These answers have become a lot less confident in recent months though, and several breweries I’ve spoken to have admitted to having multiple alternative strategies for the next 12-18 months, in some cases delaying investment until they know whether trade with the continent will still be viable after March. In a business with pretty narrow profit margins, this uncertainty is keeping brewers awake at night. The EU is the single largest export destination for British beer, accounting for around 60% of UK exports, with the next largest market, the US, accounting for just 20%. But as well as the cost of importing and exporting the beer itself, the detail of any Brexit deal (or the possibility of no deal) could have a big impact on the cost of ingredients. In the event of no deal, we would revert to WTO tariffs, amounting to a 3.2% hike in the price of hops, 11% on glassware and 1.7% on capital investments such as bottling and labelling machines. Not only will this apply to trade with EU countries, but also to any other nations with which we don’t have a trade agreement (basically, all of them just now). "On a practical level, we’ve effectively written British companies out of our suppliers now"
The Maltsters Association of Great Britain – which represents 98% of UK malting production – is similarly concerned about the cost of losing Europe’s trading arrangements and support structures, citing estimates that withdrawal from the Common Agricultural Policy could lead to the loss of about 250,000 jobs in non-farm businesses, mostly in rural areas. Its number-one priority is continued free trade with EU members and favourable deals with other important partners such as the US and Japan. Does all of this mean the end of craft beer in the UK, or at least of collaborating with our European neighbours? Come March, are we just going to pull up the drawbridge and start getting creative with Fuggle and East Kent Goldings?